Shades Of Gray, under jockey Jorge Linares, defeating Ivory N Ashes in the opening trial for the TQHA Sires' Cup Futurity(RG3) Friday night at Retama Park. SELMA, TX�JUNE 16, 2017�Six of the ten finalists to the TQHA Sires' Cup Futurity qualified in the first trial Friday night including fastest qualifier Shades Of Gray. Coming off a 10th place effort in the Grade 3 Harrah's Entertainment Futurity in his last start, Shades Of Gray completed the 350 yards in :17.864 seconds to set the top qualifying time and earn a 95-speed index into a 12-mph headwind. Jockey Jorge Linares had the riding assignment aboard the son of IVORY JAMES for trainer Javier Noel Contreras. Owner Jose Guadalupe Rodriguez purchased the 2-year-old for $10,200at the 2016 Heritage Place Yearling Sale in Oklahoma City. Bred in Oklahoma by Bobby D. Cox, from the Ocean Runway mare Verrsace, Shades Of Gray picked up his first win in three starts in Friday's trials. He has earned $5,036. Additional qualifiers from the opening trial included third fastest qualifier Ivory N Ashes, another IVORY JAMES colt who posted a :18.021 clocking for owner/breeders Alan and Sharon Colley. Brian Stroud conditions the gray colt out of the Runaway Rebel mare Sweeten My Dreams. Juan Garcia, Jr. rode the colt who was sixth in the John Deere Sam Houston Juvenile Challenge(G3) in his last start. 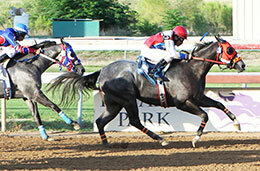 In just his second career start, Channing, a colt by Grade 1 sire DOMINYUN also qualified for the TQHA Sires' Cup Futurity. Trainer John Buchanan saddled the sorrel gelding to the final qualifying spot with an :18.193 clocking. Owned by the partnership of Angie and Bill Stanley and Amanda Buchanan-Hadley, Channing is from the Horse Greeley (TB) mare Oh My Tatum (TB). Juan Vazquez was up. The 10 fastest qualifiers, from the seven trial races conducted Friday night, will return to Retama Park on Saturday, July 1 to vie for the winners' share of a $125,000-est. purse going 350 yards. For the complete list of finalists, times, sires, dams, owners, breeders, trainers and jockeys CLICK HERE.